Briefing starts the week with congratulations to National Grid, which has completed tunnelling for its London Power Tunnels project. For the past four years two tunnel boring machines – Evelyn and Cleopatra – have been working at depths ranging from 20m to 60m to excavate a 32km network of tunnels. The final break through came last week at Kensal Green in north London and work will continue on installing the high voltage electricity cables that will meet the energy demands of a city that is estimated to be growing at five per cent a year. The first section of this electricity network in due to go live this year and the project itself is scheduled to be complete and fully operational in September 2017. 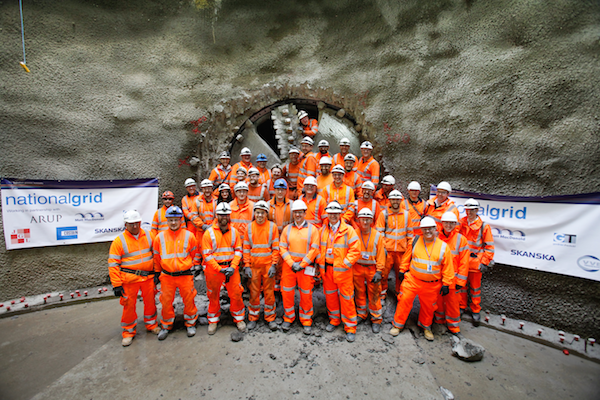 (Click here for The Engineer’s in depth look at the challenges that faced the tunnelling team). You can’t, of course, mention a piece about this engineering triumph without adding an accompanying image, if only to glimpse the front end of a TBM cutting tool and members of the team that have so far made the project a success. There seems, however, to be a distinct lack of female faces in the happy crowd and research published today questions the role of parents in helping their child pursue a STEM career. Released to mark the start of its Engineering a Better World campaign, IET’s research has found that seven per cent of parents would encourage daughters to pursue an engineering career. Talking to parents and children alike, IET found that parents with daughters believed their child would be most interested in pursuing a career in education and childcare (32 per cent), the arts (29 per cent), healthcare (26 per cent) and hair and beauty (23 per cent). Furthermore, just over half (54 per cent) of children stated that they didn’t know anything about careers in engineering, despite STEM subjects (science, design and technology, ICT/computing and maths) topping the list of subjects they most enjoy doing. A total of 39 per cent of girls surveyed said they enjoyed ICT/Computing, with the same percentage also enjoying Design and Technology. However, according to the research, girls are twice as likely than boys to say that they are not interested in finding out about careers in engineering (11 per cent versus five per cent). This lack of enthusiasm could begin in the home, with 41 per cent of parents feeling unable to support their child’s queries about a career in engineering, and 44 per cent of parents of girls saying they don’t know enough about engineering to help too. As part of the research, IET provided parents and children extra information on engineering careers, which led to 72 per cent of parents agreeing that they would encourage their child to pursue engineering as a career. Prior to extra information, fewer than half of those parents with girls would encourage their daughter to pursue engineering but the parental approval rating for engineering careers rose to 67 per cent once they were aware of the opportunities within the industry. Furnishing girls with this additional information saw their approval for engineering rise from 32 per cent to 61 per cent. To this end, Engineering a Better World will showcase those opportunities offered by engineering and dispel the myths and negative perceptions that still exist about the profession. More details can be found here. I wonder what percentage of engineers who are parents with daughters would encourage their child to pursue a career in engineering? Who recalls “The Planemakers” ? – a series about just that, set and broadcast in the 60s, brought up to date, but with ‘extra’ characters who are female. Whether we like it or not (and I for one do not!) we have to recognise that the TV and other moving meja are the route to almost everything. Link to ordinary airline (mostly female ) staff roles, jobs, prospects…but “how might it be to be an aircraft designer, not just a trolley dolly? or the person who checks-in passengers. Are there writers, producers, directors, film and TV executives out there who we can bring on side?-perhaps via the links and contacts that ‘our’ editorial staff have already. Perhaps an appeal to all ‘readers’ to search their friends and families for such as well? Not everything is as it looks. My smaller niece was the only one who loved pink. Pink princess, pink pony, dolls everywhere and role plays. She was also the one not to go to high school. Just a comprehensive. And there she excelled. And started a training program aimed at school children in a factory. Once a week. Now she does carpentry, and math is her favourite subject. She just turned 14. I for one will not encourage my daughter (or my son) to follow me into engineering as a profession. It is poorly paid (relative to other professions with similar levels of qualification), has a poor status and relatively poor prospects in the UK due to the shrinking engineering sector. Unfortunately their prospects are being perminantly blighted by their fathers profession as an engineer (i.e. low pay), so they already loose out due to my choices, I don’t wish them to compound this by making the same mistake as me in becoming an engineer. Your first paragraph is very wide of the mark on many levels.